The inaugural Asian Media Awards took place at the Hilton Deansgate hotel in Manchester on 31st October 2013, celebrating and recognising the hard work and efforts of Asian media professionals in the UK. With digital media being a very important platform to deliver news and entertainment today, the Digital category at the Asian Media Awards played a pivotal role to recognise that DESIblitz.com had the content and quality required to be deserving of the accolade. “We are very pleased that DESIblitz.com was selected as the winner of Best Website award at the first Asian Media Awards which is a fantastic platform to give Asian media contributors much needed recognition. 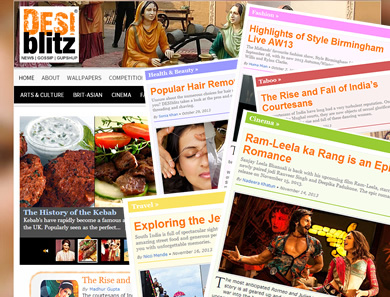 DESIblitz.com based in Birmingham, provides vibrant on-line lifestyle content which is selectively produced to cover as many aspects of ‘Desi’ News, Gossip and Gupshup in an informative and articulate way, frequently with videos that have been specfically filmed and edited to a high publishing standard. The team prides itself on publishing as much originally produced content related to its ten lifestyle categories, including Arts & Culture, Cinema, Fashion, Food, Health & Beauty, Sport and Travel. It’s Taboo category does not shy away from discussing those subjects frequently stigmatised in society and swept under the carpet. With over 11.8 million hits per month, the website magazine is continually growing from strength to strength with the highest audience in the UK followed by India, USA, Canada, Pakistan and the rest of the world. “The Asian Media Awards have been a long time coming and we are very glad to have taken part in a very well-organised event. We totally support everyone nominated and the winners for their significant contributions to Asian media today,” said Indi Deol. The Asian Media Awards 2013 have been a huge success and have given DESIblitz.com the recognition wholly deserved for being the Best Website, which brings you News, Gossip and Gupshup all with a ‘Desi’ twist.